Starters - Italian Restaurant There are 8 products to choose from. Takeaway Lanzarote - Restaurants Playa Blanca Mixed fresh vegetables salad. 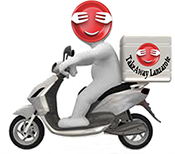 Takeaway Lanzarote - Restaurants Playa Blanca Buffalo mozzarella, tomatoes, green vegetables salad. Takeaway Lanzarote - Restaurants Playa Blanca Smoked salmon from Uga, tomatoes, green vegetables salad. Takeaway Lanzarote - Restaurants Playa Blanca Prawns, avocado, green vegetables, cherry tomatoes, olives. Takeaway Lanzarote - Restaurants Playa Blanca Fresh tuna tartare with green vegetables. Takeaway Lanzarote - Restaurants Playa Blanca Original burrata from Puglia with grilled vegetables. Takeaway Lanzarote - Restaurants Playa Blanca Selection of italian salami and cheeses with grilled vegetables. Takeaway Lanzarote - Restaurants Playa Blanca Toasted bread with fresh tomatoes, mozzarella, pesto sauce.